Our district lost power for ten hours but, from the safety of our apartment block, we merely had to manage the effects of excess water leaking in through the balcony doors. 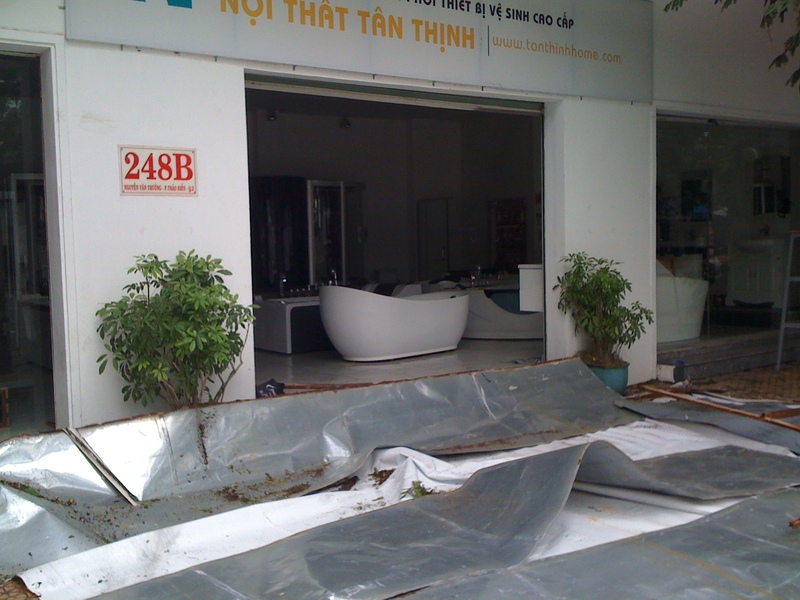 In fact, no obvious damage seems to have occured to any of the city’s major structures. Across the river from where we live, it’s a different story. Corrugated iron dwellings hang perilously over the water. Here, and elsewhere in town, as well as across more rural parts of Vietnam, the vast majoriy of residents would have spent a nerve wracking 24 hours literally clinging on to their possessions, and to their livelihoods. There was plenty of warning given about Pakhar. 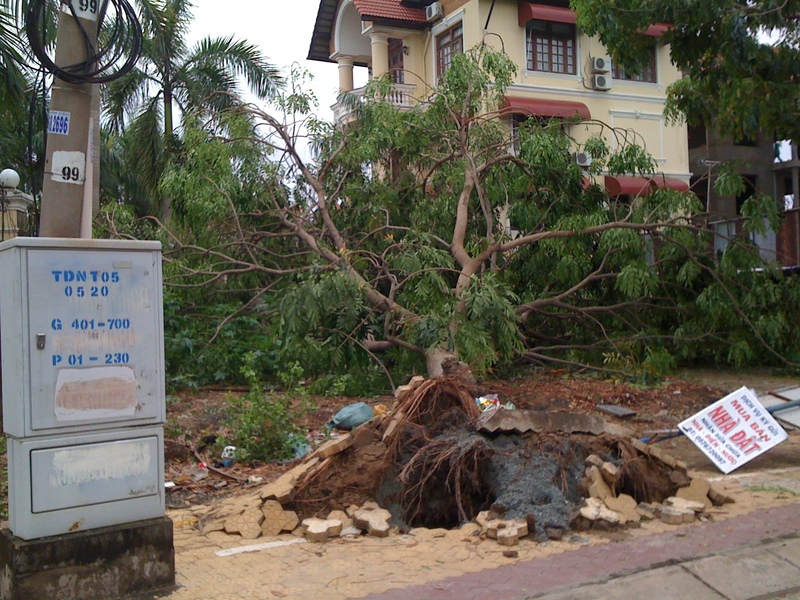 Several thousand people were evacuated from coastal areas south east of Saigon in the Mekong Delta, before the storm had a chance to put them at risk. Fishing vessels were called in, and authorities did a sound job of preventing any major casualties, although some houses did collapse, boats were sunk, and bridges damaged. 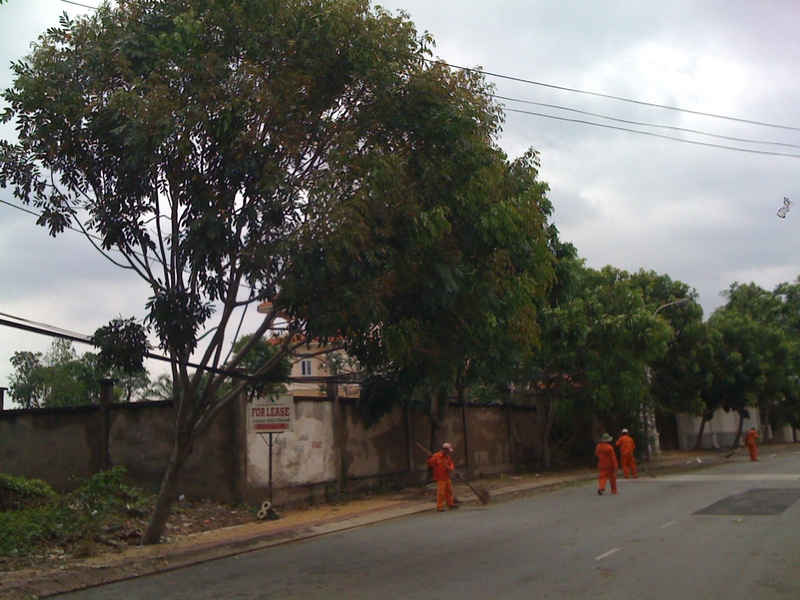 Within the close radius of our neighbourhood, road-sweepers started up the exercise of putting things back in their place almost as soon as the storm had knocked said things over. 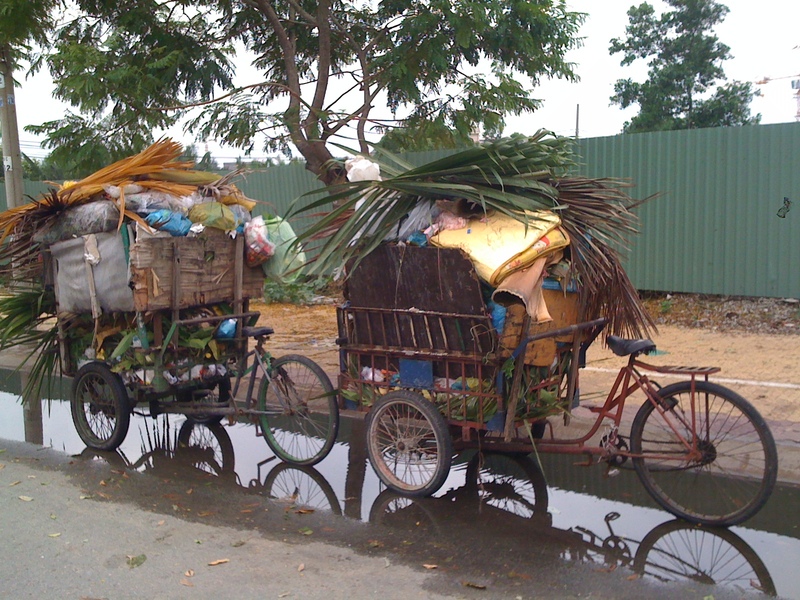 Men in orange suits and peaked caps were hard at work around Saigon in the early hours, armed mainly with brooms and carts. For the hundreds of miles of the city’s sagging electricity pylons, it was a case of untangling the myriad of wires and cables which had been blown around the bending trees and telegraph poles, leaving them knotted and swaying, precariously drooped in puddles on the pavement. Today is a public holiday (the Hung King Festival) and many offices have been closed. 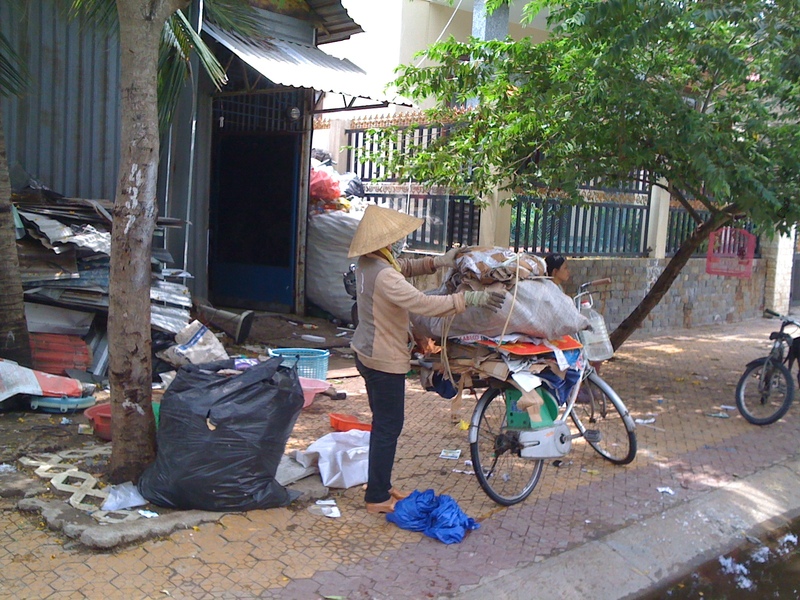 For most of Saigon’s small businesses and entrepreneurs however, this was a typical Monday, where cafes and street vendors operated as usual. The traffic was its normal mix of organised chaos, and city life resumed as if Pakhar had not happened. Pakhar was officially downgraded from typhoon to tropical “storm”, and then became a tropical “depression” once it made landfall over the country on Sunday morning. A tropical depression might be construed as oxymoronic, were it not for the frequency at which the planet’s environmental disasters now occur. Not so much an oxymoron, instead a bitter twist of irony that nature chooses to unleash its fullest of force on those parts of the world rich in natural beauty, yet too often woefully inadequate in terms of infrastructure and resources. Pakhar is the most destructive storm we have witnessed since moving here just over a year ago, although it represents only a fraction of the velocity which other seismic shocks, making headlines in recent times, have produced. Events such as the Asian tsunami in December 2004, the Pakistan earthquake of 2005 (as well as the country’s last two years of monsoon flooding) or the Japanese tsunami a little over year ago, were all of catastrophic proportion, and communities will take generations to recover. In the face of these, Pakhar was low key. Nonetheless, what can be common in all such incidents – whether they take place in this region of the world, or in a country like the UK – is the immediate and unconditional reactions that so many people display when mobilising the relief and recovery efforts required to “make things right” again. Displays of compassion and of generosity and, in my mind most compelling of all, displays of “connectivity”. People pulling together. Granted, for major emergencies, issues such as political differences or securing adequate relief funding, can unfortunately produce complexity to the situation, and compromise the humanitarian response which communities deserve when they are so dramatically affected. Connectivity does not necessarily mean we are all as vulnerable as each other to the random hand of nature, either. It is more about our ability to see the world through the very many colourful and diverse lenses which exist. One view is that a measure of success for future generations, for better or for worse, rests on the “connections” we make with each other. Can we, for example, place true value on, and therefore harness, the wise perspectives to be found in all corners of society? Whether during times of procrastination, or times where “unseasonal” weather represents the norm, hopefully the answer to this question can be an affirmative one. 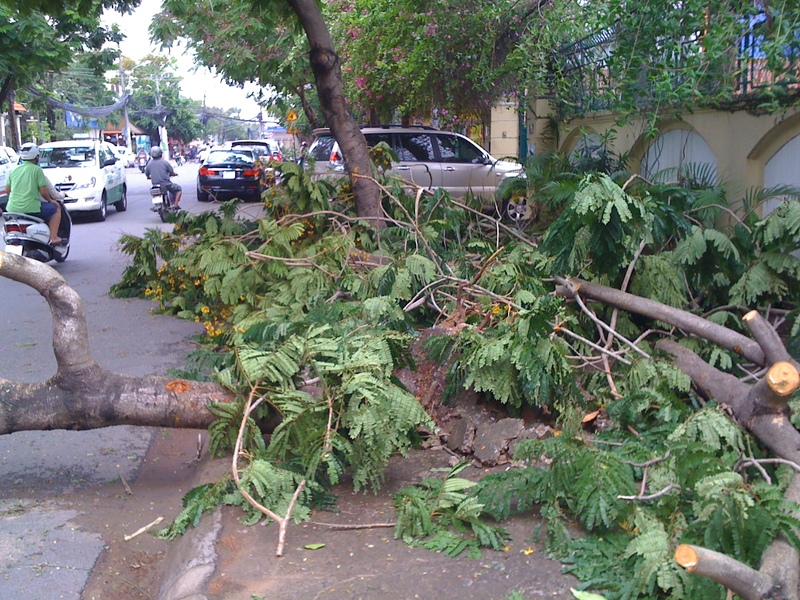 This entry was posted in Saigon Stuff and tagged climate change, humanitarian relief, typhoon pakhar, weather by saigonsays. Bookmark the permalink.